A Seminar held in Rotterdam, January 28, 2010. See also Helena Mattsson, Sven-Olov Wallenstein, 1939/1931. Swedish Modernism at Crossroads. (Stockolm: Axl Books, 2009). A modernist manifesto that leans on national identity and historical continuity. A pedagogical project that addresses (bio)politics through aesthetics. A compromise between capital and labor, crafted by avant-garde designers. 1. Uno Åhrén, Gunnar Asplund, Wolter Gahn, Sven Markelius, Eskil Sundahl, and Gregor Paulsson. It does sound paradoxical, ironic, perverse even. And yet, all these definitions fit the text with which a group of leading Swedish architects urged the public to Accept (Acceptera) modernism in 1931. 2. Sven Olov Wallenstein, Biopolitics and the Emergence of Modern Architecture. (New York: Princeton Architectural Press, 2009). Philosopher Sven-Olov Wallenstein, the author of an essential essay on architecture and biopolitics and editor-in-chief of magazine SITE, analyzed in his lecture this seminal text, its political and historical roots, and its conceptual significance at large. The Swedish manifesto – as a paradigmatic example – is taken as the starting point to tackle some key issues of the modern project of the city: the possibility of freedom in the biopolitical era, the relationship between aesthetics and consumption, and the role of architecture in the construction of subjectivity operated by a budding welfare state. Wallenstein exposes the political relevance of Swedish modernism, no mean feat in a country that worships it as a crucial part of its identity, and where discussion on the subject is discouraged if not downright taboo. Modernism has been a pivotal point in the construction of the social-democratic welfare state: touching it means to touch the very roots of Swedish society and its belief in modernity as progress. But Wallenstein dares to uncover the biopolitical apparatus behind the tenets of Swedish good design, positioning Acceptera within the wider picture of the early thirties as first critical moment of international modernism. After the stock exchange crash, the illusion that architecture had any immediate power to change reality was shattered; it became clear that the only level of decision that mattered was that of government itself. Thus, critics as Tafuri  argue, the innocent euphoria of first modernism had to come to an end or either survive by fooling itself. Under this light, its very date of publication -1931- condemns Acceptera to a niche position within the international debate: hence its quasi-mythical status of highly idiosyncratic product, untouched by, and unaware of, the larger discussion. Tafuri believes that the modernist project fails when it is appropriated by the state; but in the same period, offbeat, peripheral Acceptera authors embrace compromise as a proactive gesture, blissfully ignoring the doubts and anguishes of the teething fever of international modernism. This attitude is possible only because the manifesto targets a very specific subject: the new Swedish lower middle class. It is virtually the same subject addressed by Le Corbusier in Vers une Architecture, but with a very precise, sharp focus on the construction of an emerging welfare state. What sets Acceptera apart is its decidedly anti-utopian, pragmatic character. It is a realistic project that deals with everyday life and has little to do with CIAM diktats. Acceptera is primarily aimed at using architectural tools to reshape human behavior; behind its program, lurks the governmental desire to generate a certain freedom and responsibility while retaining control over the population. After sketching the peculiarities of the Acceptera project within its contemporary condition, Wallenstein offered its interpretation of the most poignant aspects of the manifesto. The discussion ultimately focused on three themes: continuity, biopolitics, and freedom. These issues are central to any discussion of XXth-century architecture and urbanism. Yet, they appear with extraordinary clarity in Acceptera, especially in Wallenstein’s sharp reading which outlines Acceptera in all its undiluted intensity as one of the clearest modern examples of intertwining of aesthetic and political agendas. 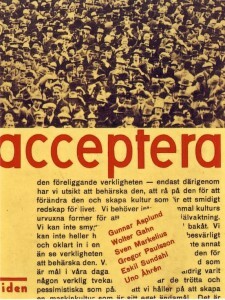 One of the most controversial aspects of Acceptera is certainly the confidence with which the authors ground their plea for rationality in the historical continuity of Swedish good craft. They never advocate functionalism in a direct way; in keeping with their attempt to create a modern milieu, they rather talk about objects that should be able to ‘orient our lives’ and shape a ‘real’ life. In this perspective, the present is seen as continuation of the past, and modernism does not represent a break with tradition or a foreign import. Modernism was always Swedish, Acceptera argues using traditional Swedish architecture as a proof. This is why the Swede should not obey, but accept the fact that they were modern from the start. Acceptera sees history as a source that needs to be rationally understood rather than imitated. Against the grain of modernism dogmas, for Acceptera there is no need to sacrifice comfort and a profound attachment to old objects, as long as the new things that we acquire do not simulate historical depth. Both the ‘fake old’ and the ‘fake new’ ultimately generate a feeling of temporal disorientation; objects should express their true relationship with history. No need to dress up the industrial commodities to make them more appealing: they are already inherently beautiful. Beauty can never arise from untruth, from objects that do not belong to their time. And beauty is not tied to formal qualities: it depends on the way things are done. For the Acceptera authors, therefore, modernism is not a style. Indeed, this attitude sounds charmingly refreshing, far from the stark, puritan moralism of textbook modernism. And yet, the debate between Wallenstein and the candidates underlined its ambiguous nature; for the pliancy of the Acceptera attitude does hide a bait for the public – an incentive to learn to desire mass-produced goods. Therefore, Acceptera can also be seen as a masterpiece of social engineering. As taste cannot be forced, individuals have to be led to desire on their own what is ‘true’ as opposed to what is ‘fake’. Acceptera is the attempt to build a pedagogy of desire. What maybe not even Asplund and his associates understood, is that this project was as much a political and economical one as it was aesthetic and social. As a matter of fact, it was a pedagogic project aimed at developing the selfless side of one’s personality. The resulting subject identifies with a collective wish and has learnt to desire what is standard. Standard objects are seen as classless, liberating alternatives to unique objects – that is to say, to objects that make users feel different and superior to someone else, following the logic of social differentiation. The standard object allows the expression of fantasy without solidifying it into fetishism. It is the collective personality of the subjects that architects are called to appeal to. In the seminar, it became clear that this is the point where the quest for social and historical continuity turns into a way shadier biopolitical plot of which, possibly, the designers are victims as much as perpetrators. This is precisely the historical conjuncture in which architecture becomes conscious of its ability to shape life processes. Biopolitics is a mixture of freedom and coercion, a condition that opens a debate on the nature of freedom itself. The Acceptera case presented a perfect opportunity to discuss this question that indeed haunts any contemporary project for the city, in an age that sees endless urbanization as unavoidable and conscious design as a form of drawing-board fascism. Against the idea of a ‘natural’, ‘spontaneous’ citymaking process, biopolitics succeed to construct subjects in order to produce a favourable milieu for the reproduction of power. Wallenstein thus discussed the very idea of biopolitics in order to frame this key issue. Foucault first understood how power in modern society is oriented towards the production of subjectivity. It generates a sort of freedom: free subjects that are nevertheless disciplined. Maximum discipline thus corresponds to maximum freedom. Foucault’s concept of biopolitics has a very strong historical specificity. On the other hand, Giorgio Agamben proposed a general theory of power, an ontological take on biopolitics. While Agamben’s point of view necessarily entails the impossibility of real freedom (ontological freedom) within biopolitics, for Foucault freedom is always historically constructed and situated: you cannot aspire at freedom as such but you constantly have to see possibilities within your historical conditions. Freedom is a practice. Wallenstein also underlined how the question of freedom within social engineering is central to the Acceptera project: biopolitical freedom can be seen as totally authoritarian, but it would not work if it were perceived as authoritarian. You are ordered to be free in order to be a rational consumer. It is a kind of induced freedom, but it does call on an active response, as the state itself educates the general public through consumption. The debate on the nature of freedom and its relationship with architecture remains an open one. The reading of Acceptera sparked an intense discussion; most candidates remarked the strong element of control implied in a text that seeks to shape cookie-cutter consumers rather than politically conscious citizens. But for us, the most controversial aspect of this episode of Swedish history remains the role played by modernist architects. While the modernist project sought to create a set of liberating possibilities, its output, as the Swedish case shows, remains much more ambiguous. While convinced to support their own leftist take on society, the Acceptera authors where actually consummating a three-way deal with the capital and the state, in a long term plan to build a seamless, isotropic, perfect society in which nothing ever happens and conflict itself loses any meaning. Professor Wallenstein mentioned the massive demolitions of historical tissue that transformed Stockholm after the Second World War. These, too, were possibly part of a process of social engineering that profoundly transformed Sweden in the smoothest democracy of the West – never a voice was raised against this seemingly unnecessary act that is paralleled only by the grandest urbicides operated behind the Iron Curtain. The naïve enthusiasm of the Acceptera authors sounds now tragic, almost pathetic, if we think that they put all their faith and intelligence into crafting what are essentially the house rules of an Ikea-like city of which they have become the critically acclaimed dream police.